Sadly there seems to be no sign of our regular foxes this year. For a good few years now we’ve had cubs playing in our back garden by now, but we’ve not seen or heard any yet, so we fear the worst. Earlier this year when I was chatting to a friend who lost their dog to having eaten something poisoned, which was thought to have been put down for foxes. That’s pretty unpleasant on both counts – somebodies pet was killed, and there seems little justification for killing foxes to me, but there’s no accounting for some people. The first fox in our garden goes back a good few years now, and sadly we dubbed him Basil. There was a bit more to the name than simply being a fox though. When he first appeared I was doing some painting in the garden and he crept up and nicked my paintbrush! There’s some shots that should convince most that foxes are loveable creatures in our family photo gallery. Do I really want to switch to Orange? Leave a comment on Do I really want to switch to Orange? I finally managed to get myself sorted to abandon Vodafone and decided to get a couple of free SIMs from Orange and try out their coverage on PAYG for a while. According to their adverts you can keep your existing number, which is critical for me. I was taking a look at this late last night, and since I couldn’t do it on line I decided to phone them. Well at around half past midnight they were experiencing a high volume of calls so claimed to have a waiting time of 13 minutes! I decided to try again in the morning – a bad mistake! Just after nine this morning I tried dialling the number that came with the the SIMs and got through to the automated service. First it asked me if I wanted a new number, no, then it asked me to confirm that I had an existing number I wanted to keep, yes. Next it told me it would transfer me to a customer operative. The message told me that Orange was committed to providing excellent customer service and then promptly cut me off! I tried again a few times, and then again through the morning (thankfully this is a freephone number) and got the same problem. Sorry James, but I’m afraid Studio 60 is no more. In fact it struggled to get aired to the final episode in the US. I think it took a break for Christmas, then stopped again in February, only just managing to air the final episodes with a change of night when it returned in May. I seem to remember hearing this and wondering whether I really wanted to get into another series that had been axed. I’m afraid I’m a little fed up with good series being axed while some utter rubbish that’s cheap to make gets similar or worse ratings and survives. I guess it is all about profit and the quality of the programme has absolutely nothing to do with anything. I think the show I am most annoyed about being axed is probably Firefly. That’s one of the best series I’ve seen in a very long while. Thankfully there was enough interest to manage a film to, sort of, finish off the story, but you could tell that there was far more story there that could have made a truly wonderful sci-fi series. Which dot dot dot… again! Leave a comment on Which dot dot dot… again! 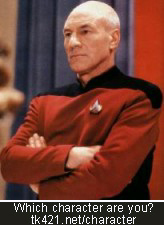 Jean-Luc Picard An accomplished diplomat who can virtually do no wrong, you sometimes know it is best to rely on the council of others while holding the reins. There are some words which I have known since I was a schoolboy. “With the first link, the chain is forged. The first speech censored, the first thought forbidden, the first freedom denied, chains us all irrevocably.” These words were uttered by Judge Aaron Satie — as a wisdom, and warning. The first time any man’s freedom is trodden on, we’re all damaged. I’ve been clearing a few things out of the study over the past few days, well study may be a bit of a grand name for it, but I tend to use it rather than office. There’s two reasons for that, firstly there’s the fact that I can’t have a dedicated office for work at home otherwise it is liable for business taxes. Secondly there’s the practical reason that it hasn’t always been an office and isn’t really one now – there’s way too many non-work bits in there. Books of all sorts (sailing, photography, cetaceans, fiction, etc., not just computing), and lots of old retro computing bits (more magazines as well as the machines and software).